National Express West Midlands (www.nationalexpressgroup.com) recently trialled a new fully electric Alexander Dennis Enviro200Evo (www.alexander-dennis.com) for a week on the streets of Birmingham, Solihull and Coventry. 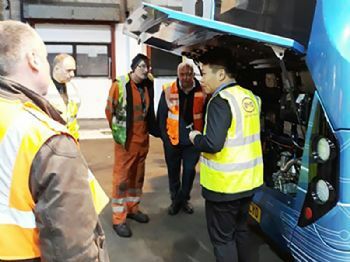 Bernie Cassidy, engineering director at National Express West Midlands, said: “We believe that electric buses are the future, and we are working closely with central government, local councils and Transport for West Midlands through the Bus Alliance to make this a reality. “Within 18 months, National Express plans to have electric buses operating regularly in Solihull, Birmingham and Coventry. The ADL Enviro200Evo does not have a ‘central engine’; instead, electricity from a series of roof-mounted batteries drives each back wheel separately via 90kW hub motors. The bus can cover 160 miles on one charge, and it can be fully charged up in less than four hours.